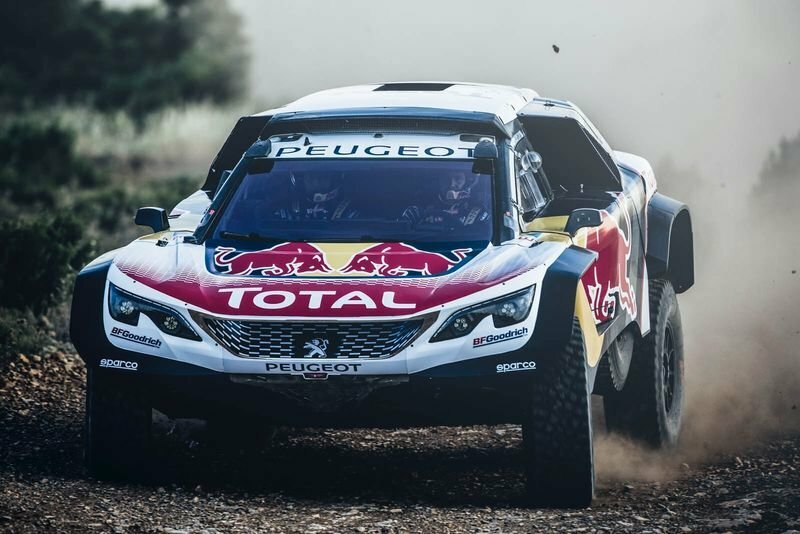 Home / Automotive / News / Peugeot Aims To Win 3rd Consecutive Dakar Rally With The 3008dkr Maxi! To win the Dakar Rally is one of the most challenging things to do in motorsports. So when a manufacturer develops a winning platform, it tends to stay at the front of the pack for years. These days it is all about Peugeot, which has won for the past two years, what you see here is the vehicle with which it aims to score again. Called the 3008DKR Maxi, which is an evolution of the 2008DKR that dominated the Dakar Rally last year, and the 2008DKR that won the year before. The major difference with the 3008DKR is that the car is wider, nearly by 8 inches. That necessitated a completely new suspension, but while the full specs have yet to be revealed, it might be possible that the specs are the same as last year's model. The 3008DKR packs a 3.0-liter twin-turbodiesel V6 with 340 horsepower, not to all four wheels, but only to two. Forgoing the added traction gives Peugeot the advantage of a loophole in the rulebook that's made it the first two-wheel-driver to win the rally in a decade and a half, stretching back to Jean-Louis Schlesser's Renault-powered buggy that last won in 2000 when the rally still started in Paris and ended in Dakar. Though still in development, the new 3008DKR Maxi will make its debut next month in the Silk Way Rally, running through Russia and China. Take a look at the images and see how this 3008DKR Maxi will be able to tackle anything!! Video: Co-driving With Racing Legend Travis Pastrana! Video: How Not To Drive At The N`rburgring When It Rains! Video: Amazing Subaru Rally Jump Ends In Violent Barrel Roll! Video: Wrc Champion Sebastien Ogier Shows Mad Skills, When He Has To Dodge Some Rowdy Cows During A Rally Stage!